Pulsed MIG welding machines have long been valued for making the process easier and providing a higher quality weld. Now, they are even more popular as the machines have become less complex and easier to use. Computerized controls make it possible for even beginner operators to use Pulsed MIG technology with confidence. Although the machines are more expensive than traditional options, in the long run they provide cost savings, which welding suppliers are working hard to boost. Pulsed MIG is a non-contact transfer method between the electrode and the weld puddle. During the weld, the electrode never touches the puddle. Instead, the machine forms one droplet of molten metal at the end of the electrode per pulse. Then, the current is used to push that single droplet across and through the arc and into the puddle. The end result is a spatterless welding process that runs at lower heat making Pulsed MIG one of the best welding processes for a wider variety of metal types and applications. does not create spatter or run the risk of cold lapping. makes more and different welding positions possible. makes more efficient use of welding wire. reduces the chances of burn-through on thin metal. As demand for Pulsed MIG machines increases so does demand for the gases and welding supplies necessary to perform the welds. Welding suppliers are keeping pace with these demands and stocking the appropriate supplies so welders can continue to explore Pulsed MIG welding. Wire Supplies. Pulsed MIG machines are capable of a wide operating range. They extend the high and low ends of wire diameter, allowing operators to use a chosen wire diameter for more applications than they might have been able to using other technologies. Welders can go from having to stock two or three different welding wires to just one. This reduces inventory costs and changeover times. Gas Needs. Pulsed MIG works in a similar way with shielding gases. One gas can be stretched to reach both the high and low ranges of their application. Again, this eliminates the need to stock multiple types of gas as well as the spare parts like guns, gun tips, liners, etc. Spatter And Fume Reduction. Pulsed MIG reduces spatter and fumes when compared to conventional MIG. That means less wire waste because more of the melted wire is applied to the joint, instead of spattered across the product piece. Reduced cleanup time and fewer fumes are added benefits. Heat Reduction. Pulsed MIG techniques tightly control heat input, resulting in actual heat reduction. This leads to less distortion, quality and appearance improvements, fewer production problems, and the ability to work on a wider range of heat-sensitive materials than you might otherwise be able to. To take advantage of the many benefits Pulsed MIG offers; turn to welding suppliers for advice, support, and service. 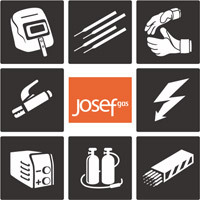 Welding suppliers like Josef Gas are perfectly positioned to help you choose equipment capable of operating with your new Pulsed MIG machines. The expanded ranges may mean you can change many of your standard orders or supply needs. be able to reduce the number of different wires you need, but that could mean you’ll need to purchase a higher quantity of the wire you do stick with. The same thing goes for shielding gas; expanded ranges mean you might need to have more of one kind on hand rather than smaller amounts of several types of gases. decide to invest in dual procedure guns so you can more easily switch between procedure pre-sets on the Pulsed MIG machines. need to purchase new welding guns that are able to accommodate the higher ranges and high current pulses unique to Pulsed MIG. To learn more about Pulsed MIG technology and if the long-term benefits outweigh the upfront cost or to order supplies for your Pulsed MIG machines, contact Josef Gas at 416.658.1212 or info@josefgases.com. Our team of welding experts is standing by ready to help you stretch your welding budget and make better business choices.